The decision of President Edwin Barclay (1930-1944) to adopt the US dollar as the sole legal tender in Liberia as from December 31, 1943 very clearly symbolizes the political orientation of the first African Republic as well as its financial and economic dependence. Simultaneously, however, Barclay’s decision is symbolic for his Administration’s desire to open up the country for foreign capital, one of the most disputed issues in the republic. The issue was partly responsible for the country’s first major political upheaval, the unconstitutional removal from office of an elected president in 1871. Immediately after having been inaugurated as President King’s successor, Edwin Barclay, a nephew of President Arthur Barclay (1904-1912), further opened the door that for so long – since 1864 – had been closed for foreign investors and traders. Barclay’s predecessor Charles King already had agreed with Firestone’s coming to the country in 1926 – aided by Arthur Barclay and William Tubman who had been hired by the US rubber company. The door had been set ajar. President Edwin Barclay, as Secretary of State one of the chief negotiators with Harvey Firestone, further opened it. After having been duly elected, in 1931, President Edwin Barclay stated in his first Inaugural Address, in January 1932: “(…) We shall encourage the investment of reproductive foreign capital (….)”. He thus repeated what his uncle had already said in 1904. President Arthur Barclay stated in his first Inaugural Address: “(…) We can only save and develop our Hinterland by the help of the European trader (…)”, including white Americans in this group as well. Arthur Barclay, however, failed to get parliamentary support for his ideas. One of the first official decisions of President Edwin Barclay was to repeal the famous port of Entry Law of 1864 that had restricted the economic activities of foreigners in the country. Subsequently, in the early 1930s concession agreements were signed between the Liberian Government and Dutch, Danish, German and Polish investors. Significantly, in 1937 President Barclay, after pressure of the USA, withdrew the concession agreement with the German investors, who were accused of sympathies with the Nazi regime in their home country. 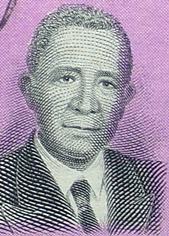 President Edwin Barclay had to overcome numerous political problems and even threats to Liberia’s survival as an independent republic. In the early 1930s a small group of Liberians, mostly retired Government officials, petitioned President Barclay to invite the US Government to take over the administration of the country – which Barclay refused to do. In the same period, the League of Nations attempted to impose a Plan of Assistance in the aftermath of the Forced Labour Scandal. This would have meant the end of Liberia’s souvereignty. Last but not least, the Administration of President Barclay had to handle more than one tribal revolt. The most violent one, the 1931 Kru revolt, turned into one of the most serious tribal insurrections in Liberia’s history. Its surpression by the Liberian Frontier Force (Liberia’s 'army') caused the British government to break off diplomatic relations with Liberia. The Liberian Frontier Force subsequently was put under American command. During the first quarter of the 20th century both British and American currencies freely circulated in Liberia and were legal tender. The arrival of the Firestone Company in 1926 enhanced the importance of the American dollar since the US company, the largest employer in the country, paid its employees in US dollars. But the arrival of Firestone brought more changes, notably as a result of the US $ 5 million loan that accompanied the US investment. Consequently, in 1944 all of Liberia’s revenues - and expenditures – were controlled by the USA. The modern economy of the republic completely depended on the Firestone Plantations Company whereas financially it was controlled by the Bank of Monrovia. This bank, a Firestone subsidiary, had in 1930 become the only bank in the country after the withdrawal of the Bank for British West Africa. Moreover, Liberia’s 'Army', the Liberian Frontier Force, was under the command of a US Army officer following the departure of the commanding British military officer. Furthermore, during World War II, in 1942 the US Government had obtained a military base in Liberia and later it granted a loan to Liberia with the proceeds of which the Free Port of Monrovia was constructed and a railway built, connecting Liberia’s first iron ore mine at Bomi Hills with the Monrovia Free Port. Thus, when in December 1943 President Edwin Barclay’s decided to outlaw the British pound and to make the US dollar the only legal tender in the country, it was a logical decision that confirmed the political orientation of the country as well as its financial and economic dependence. The decision paid well off as was demonstrated by the arrival of very enterprising and colourful US investors such as Lansdell Christie and Edward R. Stettinius. Lansdell Christie, a former colonel in the US army who during World War II had served in Liberia and thus had become acquainted with the country and its economic potential, started Liberia’s first modern iron ore mine with the creation of the Liberian Mining Company, in 1945. Similarly, Edward R. Stettinius had become familiar with Liberia during his official duties as US Secretary of State. After his retirement, in 1947, he concluded a major concession agreement with the Liberian Government resulting in the creation of The Liberia Company and Liberia’s flag-of-convenience policy. Many other investors, from the USA, Sweden, the Netherlands, Germany followed. All this happened during the Administration of President William Tubman to whom Liberia’s Open Door Policy usually is attributed. It is obvious, however, that he would never have succeeded without the work of his predecessors. Source: Fred P.M. van der Kraaij, ‘The Open Door Policy of Liberia. An Economic history of Modern Liberia’ (Bremen, 1983), Chapter 2, The origins of the Closed Door Policies and Open Door Policies 1847-1947, pp. 12-46.